Udupi , June 03, 2017: Reports confirm the construction of a tree park on six acres of land at Yembattu Badagabettu village, near Udupi, at a cost of Rs. 1.25 crore, is in the final stages, and is expected to be inaugurated by the end of this month. This park, constructed by the Department of Forests, is located next to the T.A. Pai Management Institute (TAPMI). In fact, the six-acre land is part of 275 acres of reserve forest area. The foundation stone for the construction of the park was laid on August 22, 2016. Already, the construction of seven gazebos — three for dining and four for resting, and a central pergola are in the final stages. As many as 30 granite benches have been installed in different parts of the park. An image of a tree taking a human form and welcoming visitors with several hands, being constructed with cement and fibre, at the entrance of the park, is attractive. A portion of the park has been fenced. Boards explaining the importance of conservation of environment and giving details of various animals and birds will be installed. A one-kilometre walking track has been constructed so that people can take a walk and relax. Other pathways too have been constructed. A canteen and four toilets have been constructed on the left side of the park with pinewood so that it lasted long. That’s not all. A children’s corner too is being constructed in a 50 ft by 40 ft area in the park, where several activities would be available for them. Besides this, a medicinal garden is being set up. 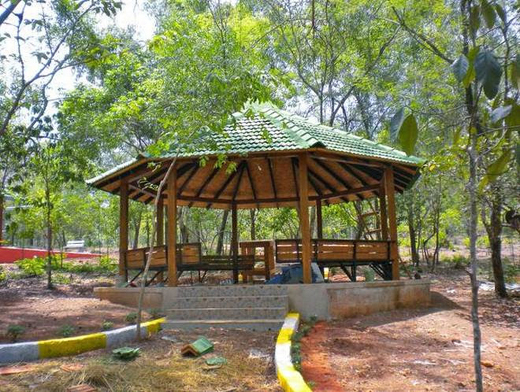 Motivating : “The intention behind the construction of the tree park is to create awareness about environment among people and to provide them with a place to de-stress and relax,” said, Clifford Lobo, Range Forest Officer, Udupi Range. After the inauguration of the park, entry fee for it would be fixed. A fee of Rs. 10 per adult and Rs. 5 per child is likely to be fixed. This would help the department run the park in a sustainable manner. “Before October, we will take up a major publicity drive to encourage school students to visit the park. As the park is located on the outskirts of the city, it will also be a place for people to visit for a picnic and get a feel of being in a forest,” he said.